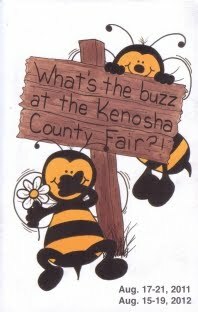 We thought today we would talk about the Kenosha County Fair which begins in just a few days. Opening day is August 17 and runs through August 21. This is one of the summer events I look forward to all summer. There is so many different events going on that the whole family can enjoy. Plus it is an affordable way for the whole family to enjoy the day. Admission Fees Include All Activities for the entire day except for the carnival and the IRA racing on Saturday night. Fair opens at 8:00 and closes at midnight. You will be amazed at how fast your day will go. So what is there to do at the fair ? Plenty ! Although every year there are new events added you can always count on some of your favorites every year. Kids love the Carnival Rides and the games. What really nice is that the have the location of the rides in two separate locations. There is the main drag which if full of rides more geared to adults and older kids. Then not far away is a section for all the kiddie rides. It's makes it a much safer environment for the little ones. There is even wrist band days where you pay one low price to ride as many rides as your stomach can handle. Those carnival games are a parents nightmare. How many times I heard " Please mom just one more dollar, I know I can win that huge teddy bear " and many dollar later they come walking away with a 3 inch teddy bear instead of the 3 foot teddy bear. Then of course there is the judging. Many are at the fair to show off their pride and joy. Whether is is for their animals, arts and crafts, sewing projects or foods. My favorite is the flowers. It amazes me to see all those beautiful flowers as I don't have a green thumb and can kill a flower just by looking at it. Then of course you have the shows and entertainment. They have many different show and activities throughout the day. One of my favorites is the pig races. You can't help but laugh at these little guys. More than once the gates have been opened and you are waiting for the race to begin and they just stand there looking around at everyone. If you aren't into pig races that's ok as there are many other shows to watch. Whether you want magic, log craving, tracker pulls or music concerts. For a list of dates and times for all events here is the daily schedule. One of the best things about the fair is the variety of great eats. Check back tomorrow as we will be chatting about all the great food and sweet treats.